Soviet artist Vasily Svarog, real name Vasily Semyonovich Korochkin (5 March 1883 – 31 December 1946), was born in the city of Staraya Russa of Novgorod province (now the Novgorod region) in a peasant family. Aged two, he lost his father, and his mother was engaged in education of children. The desire to draw appeared in the early age. Noticing it, his art teacher Chistyakov collected money among residents of the city Staraya Russa so that the talented child could continue his art education. In 1896, at the age of thirteen, Vasily Semenovich enters the Central School of Technical Drawing of Stieglitz in St. Petersburg, and four years later he successfully completes it. His pseudonym “Svarog” was given to him during the school years. 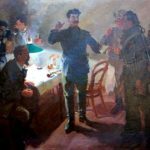 In 1918 Svarog takes an active part in the decoration of Petrograd to the celebration of the first anniversary of the October Revolution. 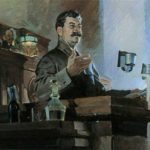 The artist himself said that he “worked most intensively, as demanded by the great events of every great exertion.” At this time, he creates portraits of Karl Marx, Friedrich Engels, Lenin, MS Uritsky, and VV Volodarsky. Alongside with a career of an artist, Svarog was a talented musician, performing as a guitar virtuoso toured Russia. From 1919 to 1922 in connection with the serious illness of his mother he went back to Staraya Russa. Here he organizes the People’s House, creates an art studio, amateur choral and orchestral societies, amateur opera house, where they staged “Mermaid” by Dargomyzhsky, “Aleko” by Rachmaninoff, “Faust” by Gounod. 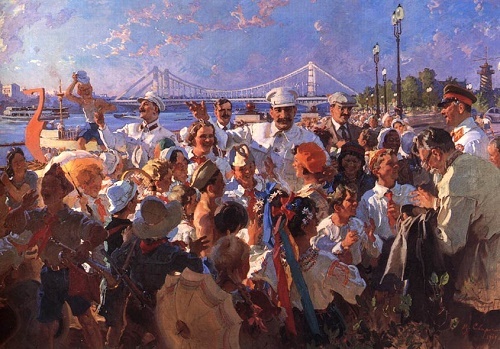 During this period, Svarog creates a lot of paintings devoted to the city and its inhabitants – “Portrait of Vasya Ushakov”, “Children” (exhibited in the Tretyakov gallery), “Portrait of Valentina Kazarina”, and others. 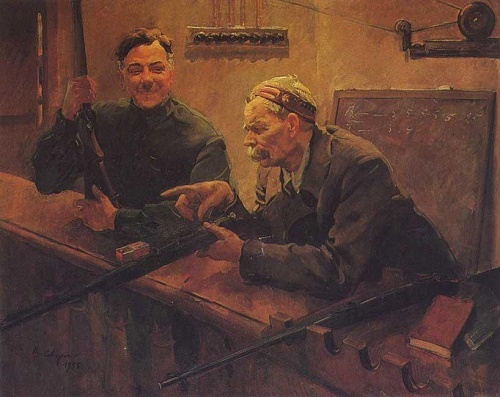 In 1923 he joined the Association of Artists of Revolutionary Russia. Two years later, Svarog received a silver medal at the World Exhibition in Paris for the album “On January 9”, for which he made 11 large drawings. After the Great October Revolution creativity Svarog acquires a bright political orientation. The artist himself calls his genre “political composition”. 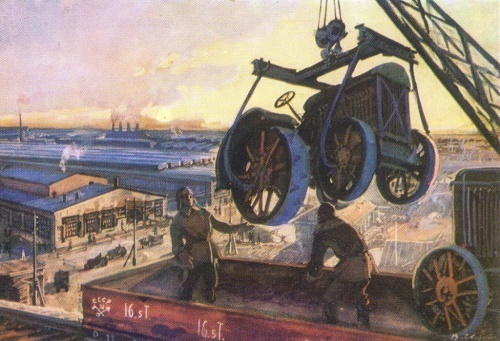 Some paintings were carried out on the basis of personal experience, others on the basis of newspaper reports: “Heroes-pilots in the Kremlin before the flight” (1934), “Meeting of Chelyuskintsy on Red Square” (1934), “Portrait of Kuibyshev on the platform (1935), “The first of May – pioneers” (1937), “Sedovtsy on Red Square” (1940), “Portrait of Tchaikovsky” (1940), “Portrait of Mayakovsky” (1940), “Kuznetskstroi”, “Dnieper”, and others. 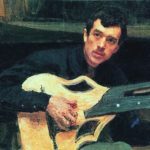 Carried away by the music, V.Svarog created a series of works united by the topic: Still Life with Guitar (1934), a portrait of guitarist Shaumyan (1928), a watercolor portrait of a Spanish guitarist Andres Segovia (1927). 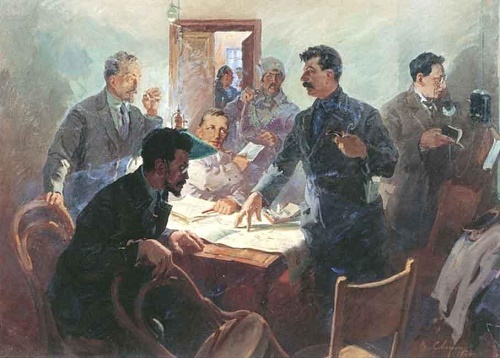 Svarog created portraits of party and government leaders – Lenin, Stalin, Voroshilov, Kuibyshev. 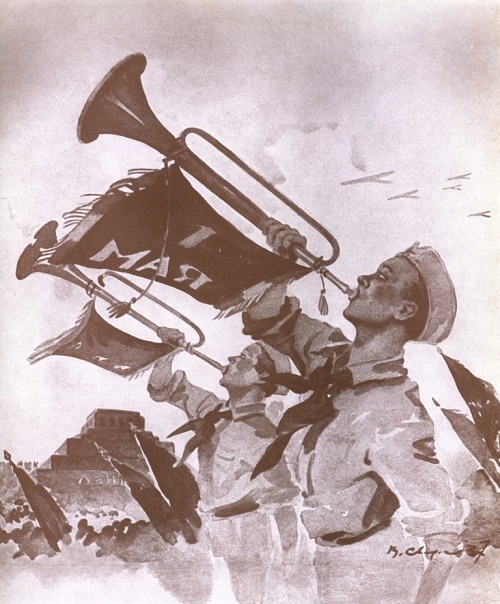 In 1940, the Political Department of the Moscow Military District combined professional martial artists of the Studio of military artists of Grekov with amateur artists of Red Army. Before the studio was put the problem of the cultural and political education of soldiers. The head was appointed V. Svarog, who created a series of paintings on military themes: the Council of commanders, Smolny in October, Storming the Winter Palace. 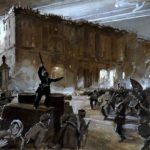 During the Great Patriotic War of 1941-1945, the artist was evacuated. First, to Nalchik, then to Tbilisi. May 25, 1942 Tbilisi hosted an exhibition of his paintings. 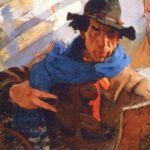 In 1942 Svarog finished his last painting – multi-figured composition of Stepan Razin. In October 1942, returning from evacuation to Moscow, at Samarkand train station, crossing paths with suitcases, V. Svarog tripped and hit his left temple on the rail. On October 10 in bad health condition, he was taken to Moscow. 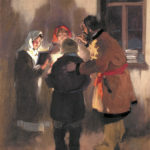 V. Svarog recovered, but was unable to return to painting. December 31, 1946 Vasili Semenovich Svarog died. He was buried at Novodevichy Cemetery. The tombstone on the grave of VS Svarog made his pupil – People’s Artist of the USSR NV Tomsky. Name of Vasily Svarog is associated with the name of Sergei Yesenin. The artist was also in the hotel “Angleterre” December 28, 1925. Svarog was in a room of Yesenin at a time when he was removed from the loop. V. Svarog at this point created a posthumous portrait of Yesenin.